I don’t know about you, but I could use a cocktail. Whew! What a week. If you follow along on Instagram, you may have noticed that I traveled to Mexico earlier this week for business. One of my clients has an annual meeting in a tropical location every winter. You may remember me mentioning this in the past. It’s a lovely, luxurious trip albeit an exhausting one. I usually end of traveling for a full 12-15 hours (21 hours one year! ), working for a day and a half, and then traveling 12-15 hours back home. While I hate to complain about traveling to some of the most beautiful and way-out-of-my-price-range resorts in the world, it just takes a lot out of me. So today’s cocktail is a homage to my most recent trip, while also serving as a relaxation remedy for me. We’re only a few hours away from the weekend, after all. It’s no secret by now that I loooooove me some margaritas. They are probably my most consumed mixed drink (for some reason, gin and tonics aren’t registering in my brain as a mixed drink. Is that weird?). There is nothing better than a salty-sweet marg and some chips and guacamole/salsa. It just puts me into serious relaxation mode, especially in warmer weather. 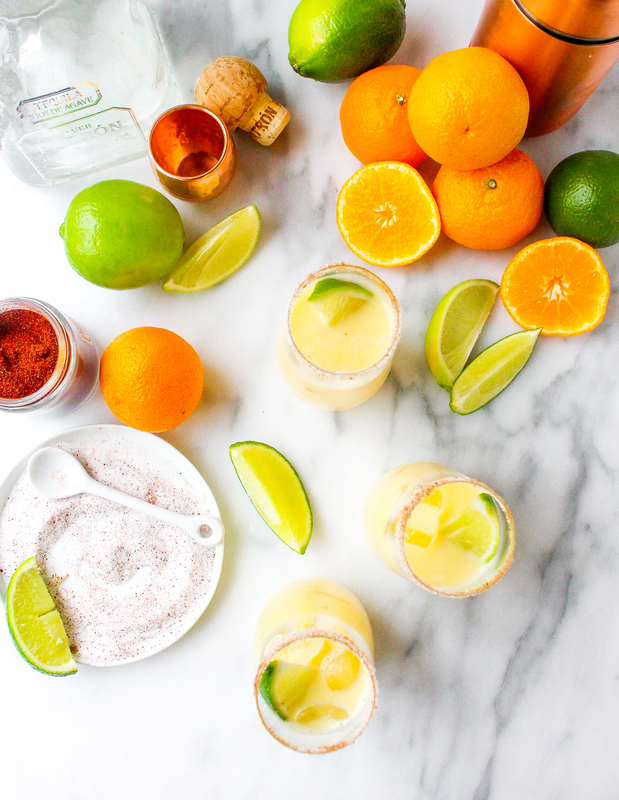 Given that it’s January (whomp whomp), and warm spring evenings and summer pool days feel forever away, I thought I’d make this margarita with some winter citrus. Clementines, to be exact. I hoard clementines every winter. They’re only around for a few weeks, usually showing up a week or two before Christmas and disappearing again sometime in late January/early February. Between two adults and a toddler, we easily polish off an entire crate weekly. I adore them. Part of the reason I think I love them so is how easy they are to peel! I never (literally, NEVER) eat oranges. But I love them! The peeling totally turns me off. But not with clementines! Their tender skin is so easy to peel away, and the resulting segments of fruit are like juicy little jewels that explode in your mouth. Kieran has developed a fondness for them this winter, which makes my mom heart so happy. 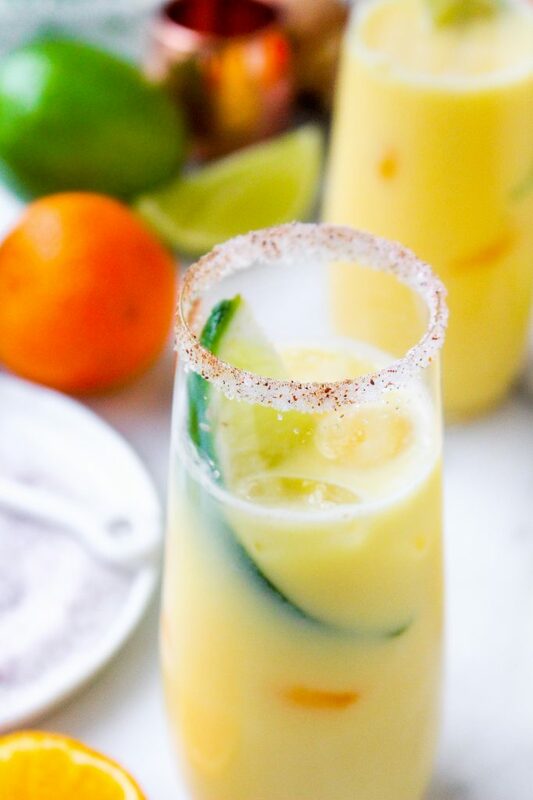 Given my love for these cute little citrus fruits, it only seems natural that I would try to incorporate them into one of my fave drinks. Just in time for the Super Bowl party preparations! 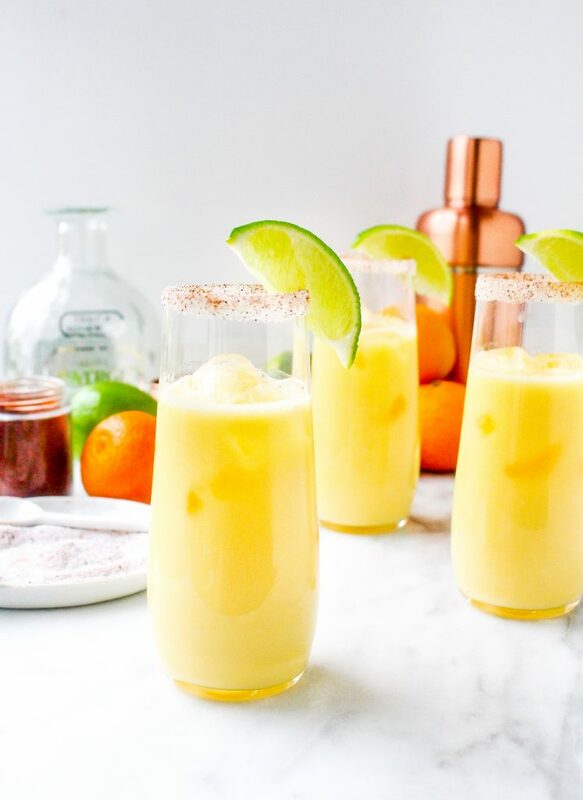 I am confident that if you were to mix up a pitcher of these, they would disappear in no time, alongside the chili and nachos you’re surely serving for the big game. With a healthy glug of coconut milk, too, because we ARE paying homage to the tropics, after all. 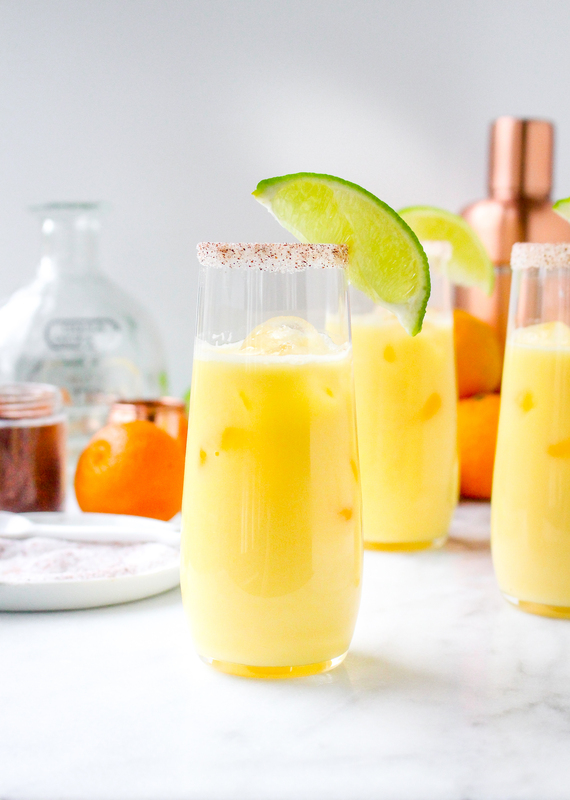 These margs end up tasting like boozy creamsicles. OMG. They are so delicious. I tested them on Wednesday to ensure they were as fabulous in real life as they were in my head, and thank heavens, they were. Maybe even better! The only problem was that I tested them before noon on a weekday while home alone. Don’t judge me. To give these margs a special little kick, I rimmed the glasses in a combination of sugar, salt, and chili powder. The chili and citrus flavors have a natural affinity for one another, and that definitely comes through here. 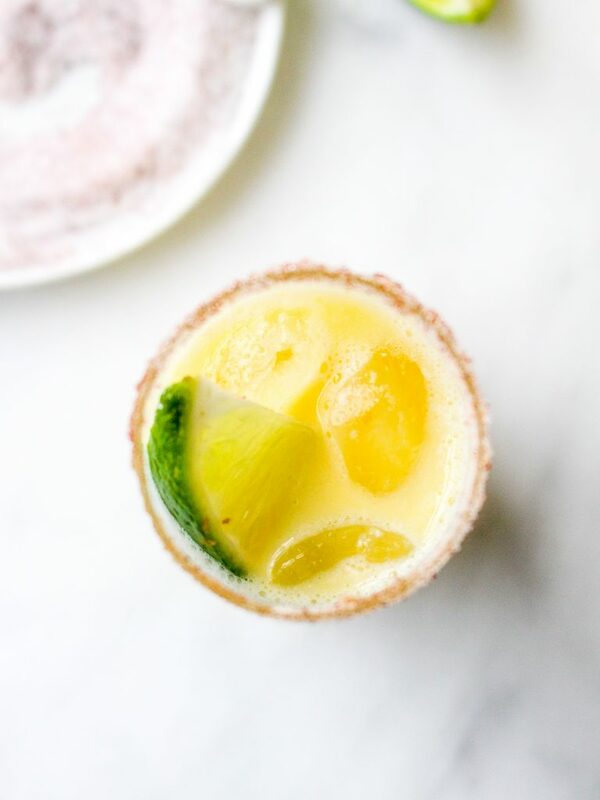 It just adds that little extra special something-something to these margs. 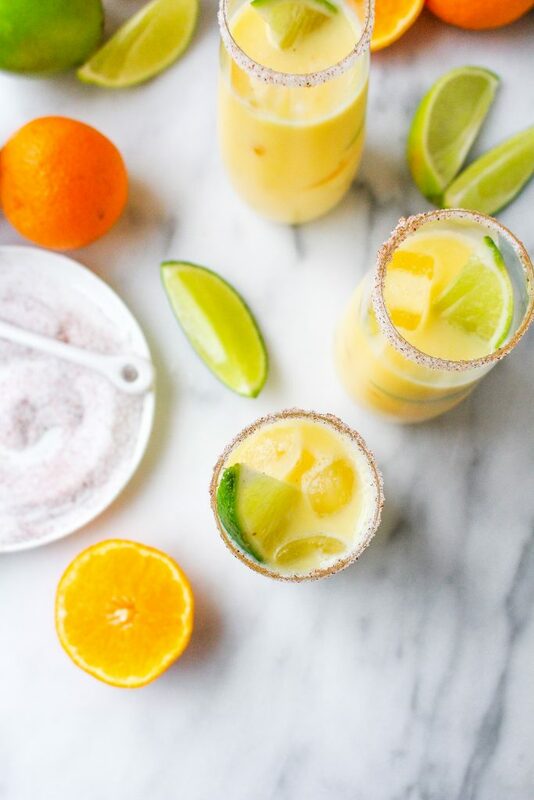 If you’re looking for a fun way to brighten up your January weekend, give these margs a go. They’ll transport you to the islands in no time. Or at least give you a good buzz. In a small bowl, whisk together the salt, sugar, and chili powder until well mixed. Pour onto a plate or into a shallow bowl. 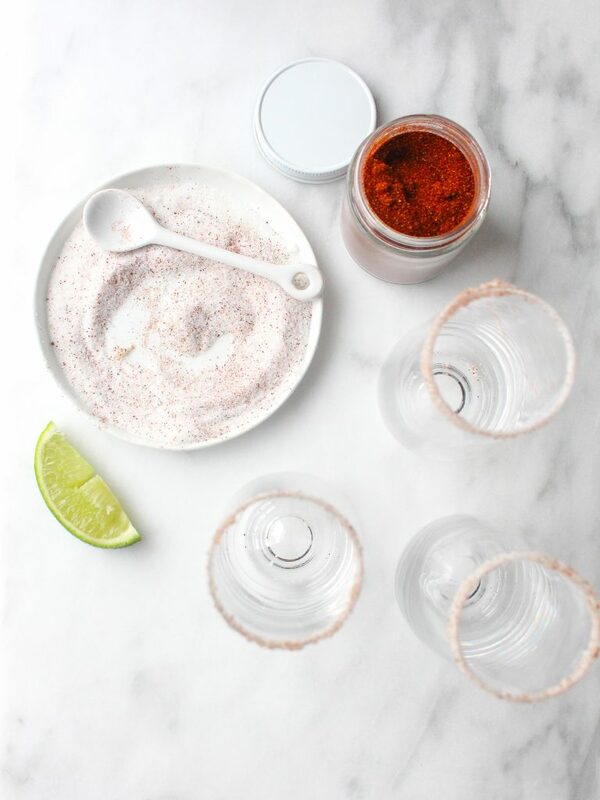 Rim the edges of two chilled glasses with a lime wedge and then rim the glasses with the chili salt. Fill the glasses with ice. 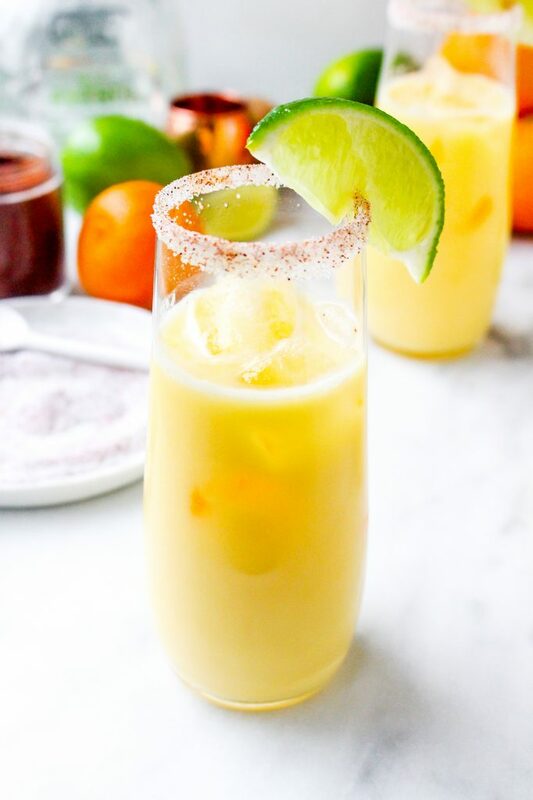 To a cocktail shaker filled with ice, add the orange liqueur, clementine juice, lime juice, tequila, coconut milk, and agave nectar. Shake vigorously for a few seconds to thoroughly mix and chill the ingredients. 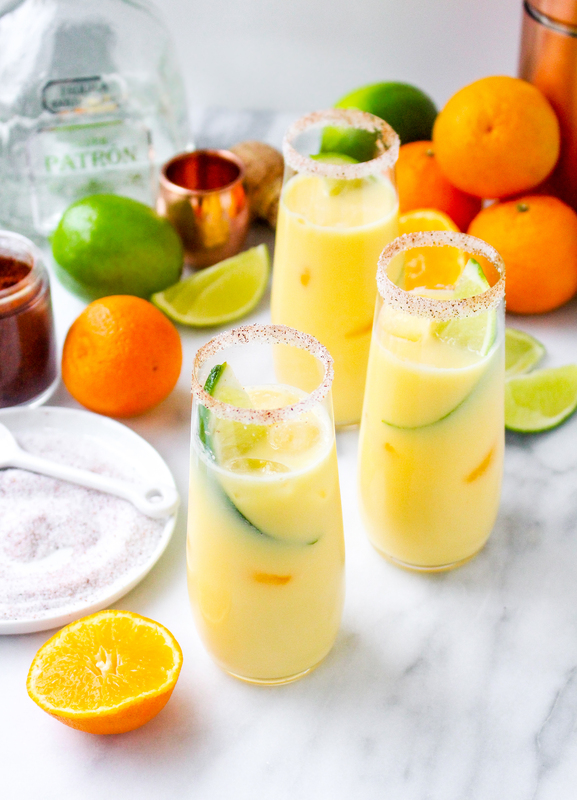 Divide the mixture between the two glasses and garnish each with additional citrus slices. Serve immediately.